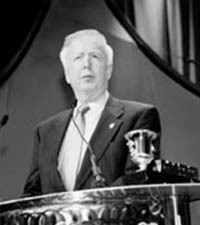 SEMA Hall of Fame - Red Roberts, 2000, McLeod Industries. Roberts is the founder and president of McLeod Industries, and he has to his credit many innovations in the field of clutch and flywheel technology for the full spectrum of performance and racing applications. He developed the slider clutch in the 1960s, among other ideas and features to help competitors who have relied on McLeod products since the company was founded in 1971. But more important to Roberts and his customers are the many clutch and flywheel safety features for which his inventive mind is responsible.